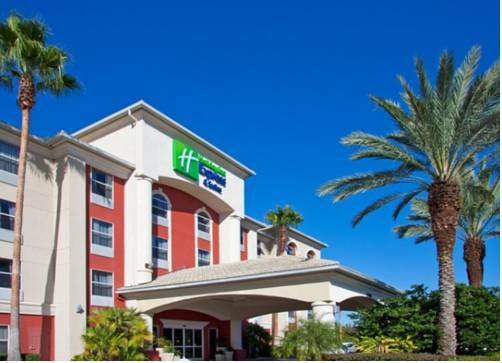 Guests staying at the newly renovated Holiday Inn Express Hotel & Suites Orlando International Airport save travel time with our convenient location, enjoy Orlando's newest guest rooms near Orlandos' top attractions. While in Orlando, the hotel's guests can meet Mickey and Minnie at Walt Disney World Theme Parks and enjoy easy access to the nearby Orlando International Airport (MCO). Corporate travelers can use the Business Center, which boasts print and copy services, making it easy to complete paperwork on the road. The close proximity to Orlando International Airport means the hotel's amenities include free airport shuttle service for guests. Thanks to our excellent location in Orlando, Florida, this hotel's guests find themselves just minutes from world-famous attractions like the magical Walt Disney World Theme Parks and Universal Studios. Spend a few days at the parks, and then set aside the rest of your vacation to explore SeaWorld or take an afternoon to tour nearby Gatorland. After arriving via Orlando International Airport, the hotel's visitors can use the free shuttle that runs to the hotel. Each morning, enjoy the complimentary, hot Express Start Breakfast Bar, and plan your itinerary with the free high-speed, wireless Internet access. Book today, and we'll see you soon! A full service restaurant serving, Breakfast, Lunch and Dinner 24hrs a day. A full service location serving "FAST FOOD" for Breakfast, Lunch and Dinner. A full service location with great food and service for lunch or dinner. A full service location with great food and service for lunch and dinner. Ground floor private meeting room off lobby. Downtown Disney offers Shopping, Dining, Arts and Entertainment, Nightlife, Sports and Music. Aquatic life, thrilling rides and shows. Port Canaveral is one the largest cruise ports in America. Water slides, pools. Open year round. The Florida Mall is a tourist attraction and the largest shopping mall in Central Florida. Orlando Premium Outlets has over 150 outlets of designer labels and brands. Hunter's Creek is a public golf course in Orlando Florida. Cocoa Beach is the closet beach to Orlando Florida. Beltz Outlet Mall has over 170 shops and eateries and over 700,000 square feet of shopping space. Walt Disney Theme and Water Parks: Magic Kingdom, Epcot, Hollywood Studious, Animal Kingdom, Blizzard Beach and Typoon Lagoon.